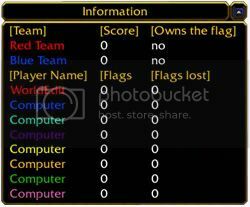 a multiboard, which stores team score and flag captures, loses. Mainly for capture the flag type of maps. This initialization is basically the same as the previous one, but one extra variable is set and the cc_players string variable arrays have changed. Then, set the text for row 1, column 1-3. 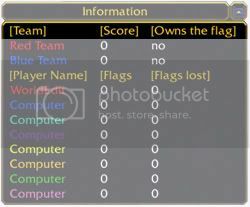 For column 1, set it to Team, for column 2, set it to Score and for column 3, set it to Owns the flag. ,and for row 3, column 1-3, for the blue team. Now, one final row has to be set, before we begin to add players and set the multiboard width and style. 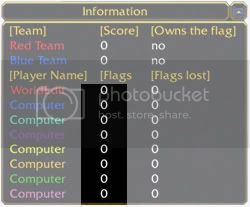 Set the text for row 4, column 1 to Player name, for column 2 to flags obtained and for column 3, flags lost. Now, the loop part. Firstly, change the multiboard style to hide all icons. After that, add the players. 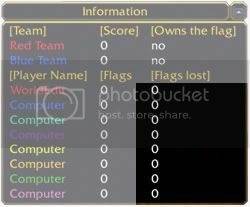 , and also the player_flag_lost variable, representing the amount of flags stolen from the player, to the multiboard. Lastly, show the multiboard. You should see something like this. For capture the flag, ther can be alot of events for updating the values. Make your own trigger with events and update the values just like with the first multiboard. 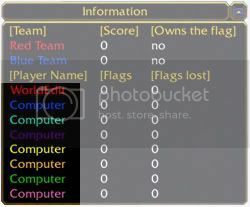 If team red captures the flag, change the leaderboard 'owns the flag' to 'yes' for team red and if the team, who captured the flag was blue, change it 'yes' fro blue team. 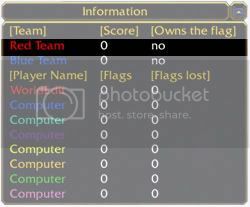 If a team loses the flag, change it to 'no'. 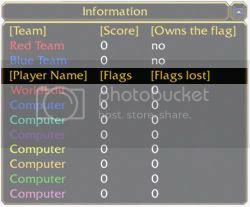 If a player captures the flag, add +1 to his 'capture score' and +1 to the 'flag lost' score to the player, whom he got it from. 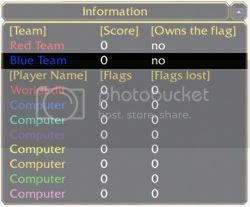 If a hero in team red enters to red base with the blue flag, set the red team score to +1. (The same for blue, if blue enters to its base with the red flag). 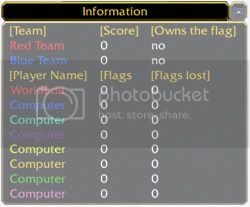 (Your events and conditions) For the 'captures the flag' and from whom the player captured it.